Here is a large clear quartz cluster featuring several unusual NATURALLY iridescent crystals, uncommon 7h faced points, and doubly-terminated, self-healed, and rainbow individuals. 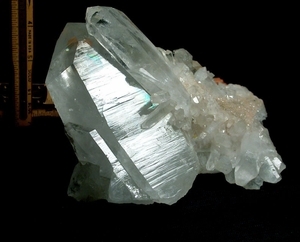 You will notice even more varieties as you examine this grouping in person: more tabular and twin, triplet and rider crystals, record keeper crystals, and glittering drusy to the sandstone partial matrix. Iridescence and rainbows change/appear/reappear as you turn the cluster, too. Overall 5-1/4x 4x 8" long. The main, stepped shield faced tabular crystal is 1-1/2x 2-3/4x 5-3/4" high! The many-penetrated doubly-terminated crystal riding to its' right is a sleek trans-channel of 4" tall. No damage, two old conchoidals on the flip side. Full of suprises! Collier Creek.